Beep beep! Ding dong, ding dong! Bzzzzzz Bzzzzzz! It's amazing how we respond to these sounds if they came from our BlackBerrys. Not unlike Pavlov's dogs, we do our own salivating; in this case, it's not for food, but for messages, calls and such. Our ears are trained to notice the familiar notification tones we have set up. For those who watched House this week- how many of you looked in the direction of your own BlackBerry every time you heard Lisa Cuddy's Tour go off? I thought so. Instead of breaking free of this conditioning, what do we do? 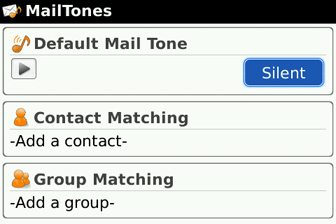 Create more tones; Tones for email, tones for SMS, tones for phone calls. It a vicious cycle with only one other option; take it to the next level. The problem is that, as a standalone solution to this, the BlackBerry doesn't offer full control. Time for an app! I thought we would take a look at a couple of options that are out there and see how they compare to each other. We'll throw Mailtones and BeBuzz (BerryBuzz) into the fray and see how they fair. Who offers more value? Which one will you pick? Will you pick both? Let's find out. Lights and Sound? How about Lights vs Sound?? First up is Mailtones, from Electric Pocket Ltd. The company has developed an impressive lineup of applications, which includes the popular FlipSide MP3 player, the photo-speed dialing PhoneFace and the Twitter client Twitterlerts. 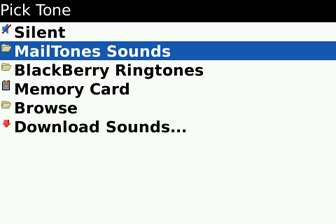 The Mailtones application is available for BlackBerrys running OS 4.2 or higher. On my Bold, I currently have version 1.0.0., which has a file size of 351 kb. The cost of the application is $2.99 and has a free trial period available. We then have BerryBuzz, or BeBuzz, from Bellshare GmbH. They two have an amazing array of applications under their belt. You may recognize the email & SMS previewing BePop, the forecast tool BeWeather and the flick scroll supporting BeScroll. BeBuzz comes in two different versions; free and premium. BeBuzz free is currently in version 2.1.40 and is 85 kb in size. BeBuzz is in version 2.1.35 and requires 87.8 kb. BeBuzz will cost you $5.95 and has a free trial. Using the main menu of Mailtones is pretty straightforward. You basically scroll through a column of options. At the top is the option to choose the default mail tone, as well as preview it. Mailtones provides several preinstalled tones of their own, or you can go online and download one out of the dozens they have. If none of those are to your liking, you can use one of your own tones. Keep in mind that Mailtones only covers emails - not SMS, IM or other alerts. With this in mind, it's pretty easy to set up the application. Now let's look at the matching options. Contact Matching – Here you can choose unique tones for specific contents. As you add contacts, the application will display them in a list, along with the name of their tone. Group Matching – As with the contact matching option, you can create specific tones for each of your contact groups. Search String – This is probably the hardest working option out of the three. The application will seek out and alert you if an email with a specific subject or a specific domain has arrived. This section allows you to pick domains from your contacts. This application offers a more robust set of visual features, covering more than email messages. Now rather than offering tones as alerts, BeBuzz uses the one thing that has mesmerized humans throughout history, dating back to the dawn of time - flashing lights. BeBuzz covers a lot of ground. You can use it to notify you about many items, including: email messages for each of your accounts, SMS/MMS, BlackBerry Messenger, Calendar, Task, Battery life and a number of IM clients. You will not see options for IM clients or sites (Facebook) until you have installed them on your BlackBerry. The application not only extends the magical blinking lights beyond the standard 15 minute cut off, but you can also modify the colours, reminder intervals, LED speed, LED flash length, muting schedules (time and date) and more. 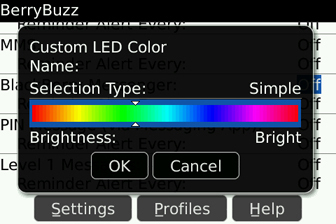 BeBuzz does give you a long list of colours to choose from, but you can create your own colours using the simple rainbow or the RGB values. You can even manage your native profiles from within BeBuzz. The application is managed in your Options menu, rather than from the icon. In fact, if you click on the icon, you actually clear your reminders. The items you wish to control are listed vertically, requiring you to do a fair amount of scrolling. It is worth it though, once you see the results. Not only is it fun to create custom alerts and reminders, but it will keep you in the loop when you have to set your profile on silent. Now your boss can't hear you checking your BlackBerry from behind your cubicle walls. So, do you think you'll use one application over the over? Or will it be both BeBuzz and Mailtones? For myself, I think I would get more use out of BeBuzz. When I'm at my desk, my BlackBerry goes to vibrate or silent, so the coloured alerts and reminders will make sure I show my BlackBerry some love regularly. Maybe you are using another application out there for your notification needs. You should let everyone know by leaving a comment. 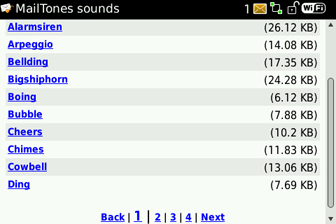 You can check out Mailtones and BeBuzz/BerryBuzz at the CrackBerry App Store.